I wandered into the back yard the other day, unlatching the gate, realizing the post the latch was attached to was showing its wear and would need to be replaced soon. I shut it gently – intending to just sit out there a bit, in the shade of the apple trees, as we’d had a busy summer, and I’d spent very little time out there, so I wanted to enjoy it a little bit while I had the chance. The one thing those three apple trees, a Red Delicious, a Rome, and a Gravenstein, have in common is that they are apples, and that’s pretty much where the similarity ends. The Red Delicious and Rome ripen in the fall, often in November, and they last forever if the bugs don’t get to them… While they’re still on the tree, they’ll just happily hang out, ripening slowly, for a month or more, and you’ve got all sorts of time to think about what you want to do with them. You could make apple crisp out of them, you could bake them, you could make cider… All sorts of stuff… You’ve got plenty of time to decide. But the Gravenstein is different. It has a wonderfully crisp texture if you pick the apples at the right time. However, it has taken me years to understand when that “right” time actually is, that time when it’s just a little tart, with enough zing to it to really make your mouth water and your jaw ache when you bite into it. You see – as I mentioned, they ripen in August. What I didn’t mention is that the wonderfully crisp texture I was referring to is available at a specific time in August. And once you get past that – usually around 10:43 AM, the apples start falling – like large, heavy, almost mushy hail. And then the birds, squirrels, and the odd opossum, and whatever bugs are hungry, have a feast, and pretty soon those apples that once held such promise, are down on the ground, pecked by birds and worms and – well, anything but us. It’s sunny this afternoon as I write this, and as I shut the gate behind me earlier, I realized, without having to look at the calendar, that we were well past the second Tuesday of August. I got out the lawn rake and started raking them into a pile where the three trees overlapped so I could toss them into the compost, and this one apple just kind of caught my eye… I was kneeling on the ground, in the shade of the Rome tree, putting them all in a big metal pan, and this one apple stood out like it wanted the attention. It was bright and red, but had obviously been visited by a bird or two, and definitely a few bugs. It would not be a part of any apple crisp, or baked apples, or cider. 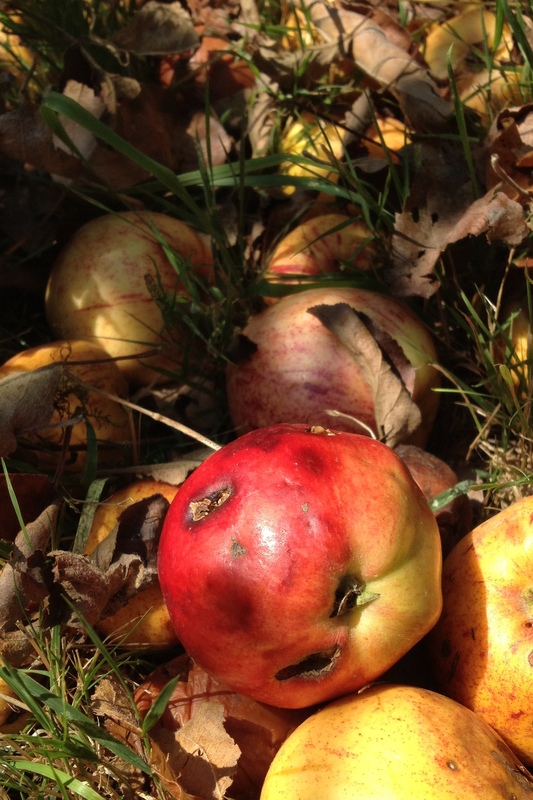 I took a picture of it and some of the other apples amidst the dry grass and the already crinkly leaves while in the shade of the Rome apple tree. …and it got me thinking. See, sometimes in life, like with those Rome apples, we’re given opportunities that last a long time… when options are many, and choices are plentiful, and you can make apple crisp, or baked apples, or cider for a long time. But sometimes, life gives us Gravensteins… they’re absolutely stunning, but unless you’re ready to pick them when they’re ready – whether you’re ready or not, then you lose out on the opportunity. And that opportunity may be rare, coming only on the second Tuesday. Between 10:38 and 10:42 AM. My grandfather had apple trees. They were wonderful. He grafted all kinds of varietals to his trees, just to find out what would happen. He tied a salt shaker to the trees because really green apples are wonderful things with a sprinkle of salt. They make your teeth hurt. And your stomach hurt. But they are wonderful. Every apple tree really had two crops: the very sour green ones that we ate right from the tree, standing in the shade. Then the ripe ones, picked at just the right time. Oh wow – I never thought of the two crops before, but that’s so true. What a neat way to describe it!